I've always loved this one. I had it hanging in my house for a while because I didn't want to part with it but I have relented and put it back in the Gallery, so it's now for sale - I can't keep them all! It was done from a drawing I first did for a lampshade design, the cows walking on their way to be milked, going all around the shade. The black and white cows are only created by the waxing their white patches and then waxing the background around the cow shapes. The black is the only part of the cloth left unwaxed when the picture is complete. 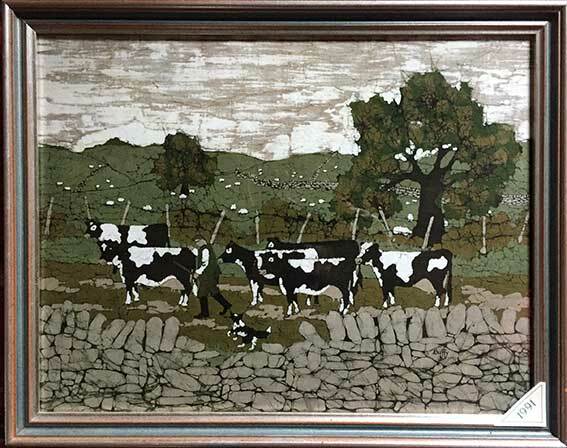 When I was doing the drawing of the patterns of white on the cows, I had to make sure that when the cows were in front of each other, the patches of white were behind black bits and vice-versa. Otherwise that shapes of each cow would merge with the next - complicated! Not quite as complicated though as the zebras I did on a lampshade years later - that was like brain surgery!